In the folder tree, navigate to the School and Department to which the course belongs. 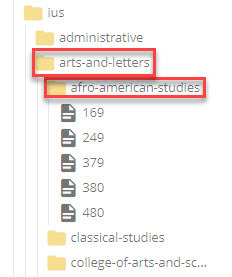 Click the arrow on the right-hand side of the Department folder or right click on the folder and select View. 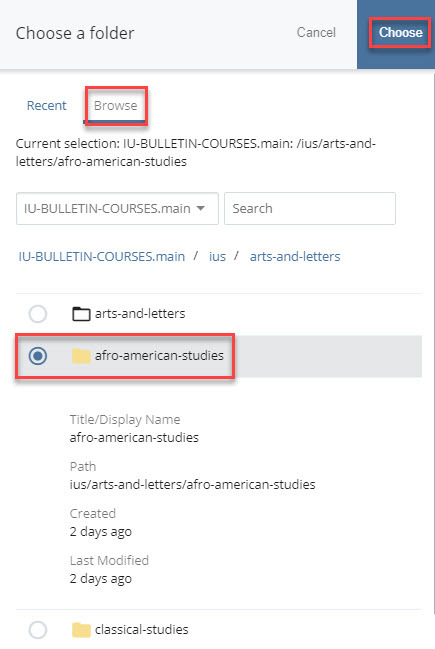 In this example, we are creating a course for IU Southeast campus, School of Arts and Letters, and the Department of Afro-American Studies. Go to Add Content > Course. In the Course page, verify that the Placement Folder (Campus, School, Department) is correct. 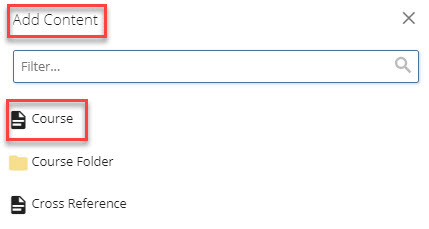 If the Placement Folder is not correct, click into the field and Browse through the folder tree. Click on the correct department folder and select Choose. Under Subject Area, enter the Subject Area code (department code, hyphen, beginning course letter). For the most up-to-date department codes, contact a Scheduling Officer for the school. This person will have access to the Course Catalog and can provide the most recent information on the courses. Enter the Catalog Number (the course number without the prefix) and the Course Title. Enter the Minimum Number of Credit Hours for the course. 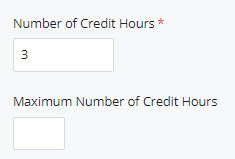 If the course may be repeated, enter the Maximum Number of Credit Hours that may be earned. If the course may be repeated, enter the conditions in the Repeatability field. If a school uses a special designation for a course (an abbreviation), enter it in the Special School Designation field. Enter any Prerequisites or Corequisites in the corresponding fields. If there are additional requirements, such as a Laboratory, include them in the Other Requirements field. Indicate the appropriate course level by checking the boxes for Graduate or Undergraduate. Some courses have the same Course Number but Different titles. These are known as Variable Title Courses. For these types of courses, one course will be designated as the Master course, and others as Duplicates. For the duplicate courses, check the box for Variable Title Course. Enter the course description that will display in the bulletin. IMPORTANT: When writing text for the course description, DO NOT use any style or formatting tools in the Description field, even though they are available. We recommend to write the description into an application such as NotePad to remove all formatting, and then copy and paste into the Description field. Additionally, use only one space between sentences.